Recent years have seen an enormous increase in protests across the world in which citizens have challenged what they see as a deterioration of democratic institutions and the very civil, political and social rights that form the basis of democratic life. Beginning with Iceland in 2008, and then forcefully in Egypt, Tunisia, Spain, Greece and Portugal, or more recently in Peru, Brazil, Russia, Bulgaria, Turkey and Ukraine, people have taken to the streets against what they perceive as a rampant and dangerous corruption of democracy, with a distinct focus on inequality and suffering. 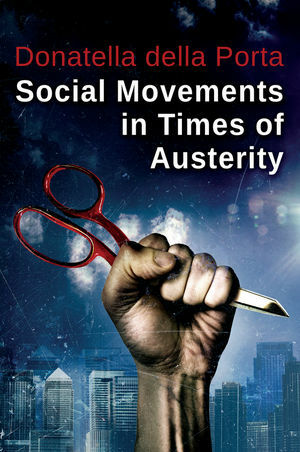 This timely new book addresses the anti-austerity social movements of which these protests form part, mobilizing in the context of a crisis of neoliberalism. Donatella della Porta shows that, in order to understand their main facets in terms of social basis, strategy, and identity and organizational structures, we should look at the specific characteristics of the socioeconomic, cultural and political context in which they developed. The result is an important and insightful contribution to understanding a key issue of our times, which will be of interest to students and scholars of political and economic sociology, political science and social movement studies, as well as political activists. Donatella della Porta is Professor of Sociology and Director of the Centre on Social Movement Studies at the European University Institute, Italy. In 2011, she was the recipient of the Mattei Dogan Prize for distinguished achievements in the field of political sociology.